This documents explains how to mount campus storage on the Mac OS X operating system on campus only. These directions apply to Mac OS X users only. Please note that you should no longer use the "cifs://" prefix. Mac OS X users can access a campus storage volumes by mounting the volume on the desktop. This is only available to anyone connected to the campus network. 1. 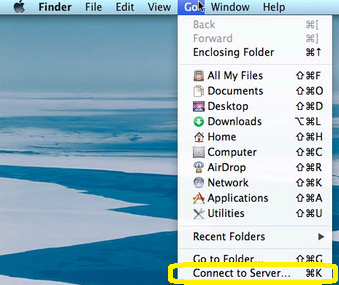 From the Finder select the Go menu and then Connect to Server. 2. In the Connect to Server window click in the Server Address field and enter the name of the server that you wish to connect to. A list of servers is at the bottom of this document. 3. After you have entered the server address press the Connect button. 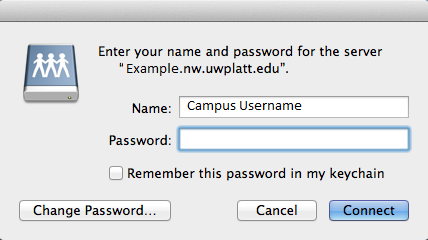 This will prompt you to login using your UW-Platteville username and password. 4. The volume will be mounted and show up as an icon on your desktop and on the sidebar in finder. To dismount a volume, drag the volume icon to the Trash icon in the Dock, or highlight the volume icon and press Command-E.